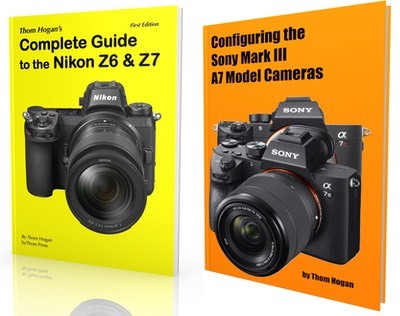 Nikon updated many of their software products this week to get them compatible with recent cameras. You should bookmark my Nikon Software Versions page, which I try to keep fully up to date. Note that all recent DSLR bodies should get the Distortion Control Data 2.009 firmware update installed. This doesn’t show up as a camera update (though it is often incorporated in camera firmware updates)! Note also that you camera must be running current firmware in order to install the Distortion Control Data update. A number of you pointed out a few small discrepancies and a couple of missing lenses on the Mirrorless Lens Availability table I published recently. I’ve updated the table accordingly. The Upward Ladder. If we assume for a moment that we have the best current sensor technology available to us, what size sensor do we put it in our cameras? Curiously, that’s a problem that the camera makers are starting to have. Article on dslrbodies.com. Current Mirrorless Lens Availability. Updated From time to time I like to update site readers on what lenses are available in the various mounts. For current mirrorless owners, it’ll give you an idea of how your system stacks up against the others, plus remind you of what you’ve got available. Article on sansmirror.com. Nikon 1 Repairs Outsourced in US. As of June 1st, all Nikon 1 products sent by dealers for repair will apparently be serviced only by United Camera, in Illinois. Article on sansmirror.com. Samsung Updates NX1 Firmware. Samsung made a second large set of improvements to the NX1 firmware with the release of version 1.3. Most of the changes were to autofocus and video. Article on sansmirror.com. Replacement Camera Syndrome. Two years ago I wrote about Last Camera Syndrome. That’s where you exit the constant cycle of upgrading your camera and just use what you’ve got, because it’s good enough for your needs. But what happens if you need to replace that “last camera”? Article on dslrbodies.com. Panasonic Restarts the G Series with the G7. The G series cameras looked to be dormant even when the G6 appeared. Panasonic themselves indicated that they weren’t sure that they would continue this DSLR-like line, especially given that they had another DSLR-like line that was well received in the GH. Article on sansmirror.com. Data page for the Panasonic G7. Fujifilm Introduces the X-T10 Camera. Fujifilm today introduced a smaller and lower-cost version of it’s X-T1 camera, the new X-T10. Still styled to look like the old Fujica bodies, the new X-T1 is a bit more like the old ST-701 with a blunted pentaprism. Article on sansmirror.com. Data page for the Fujifilm X-T10. Data page for the Fujifilm 90mm f/2 lens. Nikon Fiscal 2015 Results. Nikon today (May 14, 2015) announced their full fiscal year results for the period of April 2014 through March 2015. As expected, the news was basically one of decline. Article on dslrbodies.com. Where We’re Headed. Having tinkered with my bag contents a lot lately, I’ve come to a conclusion about DSLRs: they’re now only most useful as specialty cameras. Article on dslrbodies.com. Fujifilm Updates the X-T1. Fujifilm today announced a firmware update for the X-T1 that won’t be available until next month. Article on sansmirror.com. Olympus: “Large Degree of Failure." In Olympus’ fiscal year-end report, the headline on the Imaging Division overall presentation was, in Olympus’ own words: "Large degree of failure to meet target for mirrorless camera net sales.” Also brief info on Sony fiscal results. Article on sansmirror.com. What Camera Changes are Coming? The rumor of a new flash technology from Canon (E-TTL III) coupled with the sales decline in DSLRs gave me a bit of an Aha! moment recently. Article on dslrbodies.com. May Software Updates. Apple Raw Compatibility Updated, but only for Yosemite users. Article on dslrbodies.com. Reminder: this is a live article that updates from time to time during the month as new software and updates appear. Is Copyright Working for You? Several of the professional groups I belong to are Copyright advocates for their members, and they attempt to not only let us know when something has changed or been decided by courts that affects our Copyright, they also tend to work towards making Copyright work better for us in the future. Article on dslrbodies.com. Gray Market is Changing People’s Views. There’s another way to look at gray market product here in the US: how much are you willing to pay for NikonUSA customer service and support? Article on dslrbodies.com.